Tracing the jet features in the coma back down to surface features is not an easy task. 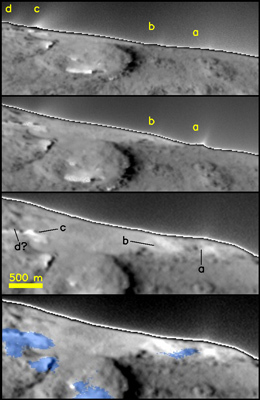 In the above image, the first three panels are a sequence of representative MRI images (9001054, 9001042, 9001026) of the limb of the nucleus showing at least four jets coming from the surface (a-d). 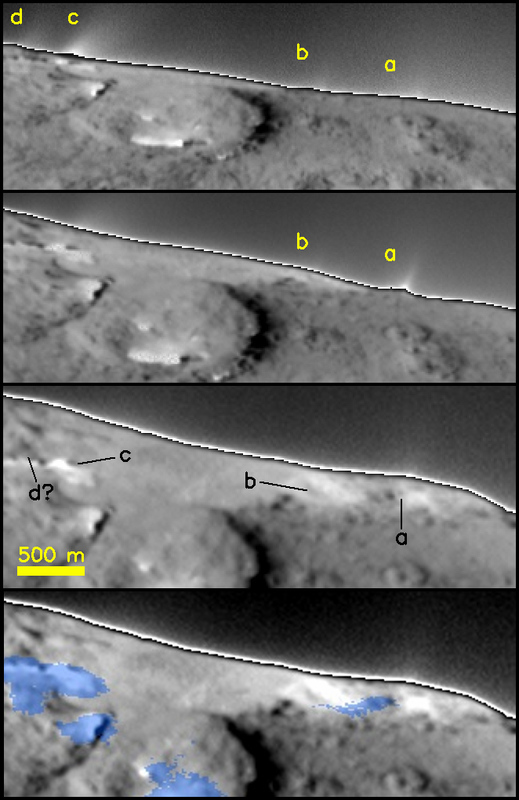 The three panels show the changing perspective of the horizon as the spacecraft moves underneath the nucleus (note that chronologically, the order of these panels is reversed). As surface features shift over the horizon, the jets pass through the plane of the sky where they are highlighted and can be traced back to their source region on the surface. Each of the jets appears to emanate from a dark spot (marked a-d in the third panel), adjacent to brighter material. In the fourth panel, regions where exposed water ice was detected are overlaid in blue for comparison. There seems to be a good correlation between the jet sources and the ice patches. The images are not enhanced, but the coma and nucleus are displayed at different contrast levels so the nucleus does not saturate the display.